Watch the statement on YouTube. Mr. Speaker, I always advocate for my constituents, and, when a constituent brings an issue to me, I always give them the benefit of the doubt, keeping in mind that there are at least two sides to a story. However, I’ll admit that when I’ve heard issues regarding my constituent’s dealings with Child and Family Services, I used to think that perhaps the emotional aspect of the situation made the interaction seem worse than it was. Well, Mr. Speaker, I apologize for that. I’ve been set straight by the Office of the Auditor General of Canada, which just released its audit of the Child and Family Services. It’s a follow-up audit to the one performed in 2014, which exposed such poor performance that it demanded to be revisited. The Office of the Auditor General has concluded, Mr. Speaker, that things have actually gotten worse since 2014, and it’s “deeply concerned” by its findings. I tried to craft a statement with a level of outrage that this situation warrants, but I couldn’t. There’s no way to adequately express the anger that everyone should be feeling right now. We should all be ashamed, Mr. Speaker, for being part of a system that treats our most vulnerable in this way. If we can’t put in the effort to get this right, then what? How bad is it, Mr. Speaker? Here are some of the findings. One-fifth of the time that someone contacted a regional health authority with concerns about the safety of a child, there was no response; nine out of 10 times, the authority didn’t maintain the minimum level of contact with a parent and a child subject to a plan of care; there were no systemic background checks on potential guardians; and the list goes on and on and on. After the last audit, the Department’s response was to introduce complex administrative changes into an already over-burdened and over-bureaucratic system instead of actually assessing whether or not it has the resources to do its job. And, Mr. Speaker, I also have to add, that 95% of the children engaged in the system are Aboriginal. Is this what reconciliation looks like to this government, Mr. Speaker? I don’t think that the Minister is insensitive to this issue, or that department staff doesn’t care about the children, but, after seeing what has happened since 2014, I’m terrified about what the future holds. This is an unacceptable situation. The Minister, and all of us in this House, need to act or move aside for those who will. Watch the questions on YouTube. MR. SIMPSON: Thank you, Mr. Speaker. Further to my earlier statement about the recent Auditor General report on Child and Family Services, I have some questions for the Minister of Health. The report notes that, over the last 10 years, there have been about 1,000 children a year engaged in the system. We know there are not 10,000 children in the last 10 years who have been engaged. Does the Minister know how many individual children in the last 10 years have been engaged in the system? Thank you, Mr. Speaker. MR. SPEAKER: Minister of Health and Social Services. HON. GLEN ABERNETHY: Thank you, Mr. Speaker. Mr. Speaker, on page 13 of the directors’ report that I tabled late last week, there is a chart that shows a number of individuals who are receiving services in any given year. For instance, in the 2017-2018 year, there are 815 unique individuals who are receiving support. If you look at that chart, it will also show that there are multiple years. Many of those kids are in the system for many years. It is not like you are in one year and you are out the next. It is sometimes the case but not always. I do not have the total number of kids that received services over the 10 years. I’m not sure that it breaks down to that detail, but I will check to see if it is available. I will note that we have seen a decline in the number of kids in permanent care, also contained in the report. 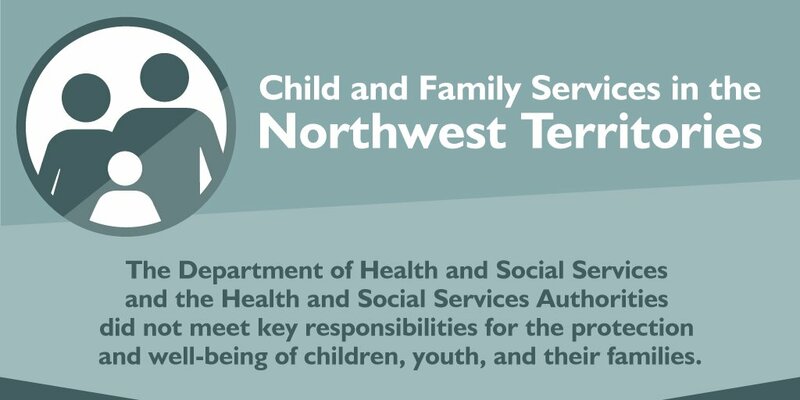 In 2008 and 2009, there are 244 kids in permanent care in the Northwest Territories. In 2017 and 2018, we are down to 152 children in permanent care. MR. SIMPSON: The reason I ask that is because we know there are not 10,000 children. Are there maybe two- or three-thousand children that have been in this system that has been failing them for that long? When you look at it that way, you realize, this is a major impact on these people’s lives. The OAG staff was quoted in a recent article saying, “Despite multiple commitments to do so, the department has still not assessed whether the financial and human resource levels it allocates to authorities are enough to deliver the required services for children and families.” Earlier, in response to the Member for Yellowknife Centre’s questions, the Minister once again made a commitment to do just that. How do we know that he’s going to do that? How can he assure us that he is finally going to do what the department has said they were going to do for years? HON. GLEN ABERNETHY: I appreciate that Members think that nothing has happened, but a significant amount has happened. In fact, we did contract with the Child Welfare League of Canada to help us do the exact work that the Member is asking us to do again. At that time, we were optimistic that they were going to provide us with a formula that would actually allow us to adequately resource the system because, clearly, we feel that it is not. We did not get a report from the Child Welfare League of Canada that said, “This is how many positions you need.” What we got was, “Here are some things you need to consider when you are actually doing the evaluation to determine how many positions you need.” We are taking their recommendations and their parameters, and we have started to apply those to help us determine what the appropriate number is but also the appropriate make-up. One of the challenges they expressed is moving away from an apprehension system to a prevention system. It changes the make-up, and there really aren’t any solid prevention systems out there. We are leading the way in many ways. Having said all that, we hear you. We have already begun the work to help us identify, and I will be and have proposed, new positions starting next fiscal year. I have already directed the department to start moving with anticipatory hiring to fill these positions. That’s step one. We need to continue to do the work that Members are describing to break in and look at the types of positions we need, recognizing that we have changed from an apprehension- to a prevention-type system. MR. SIMPSON: To clarify the Minister’s statements, I didn’t think anything. That wasn’t my thought. I quoted the Office of the Auditor General of Canada, who said that the department hadn’t done what they said they were going to do. When the Minister completes this work and determines how much resources are needed, will he commit to share that publicly so we can see exactly what needs to be done? MR. SIMPSON: Thank you, Mr. Speaker. In a CBC article today, the Minister spoke about the difficulty in retaining social workers in the territory. It’s a tough job. I mean I don’t think I could do it, and so I understand. Yet, we have a social work program at Aurora College that is being cut, and I haven’t heard anything coming from the Department of Health saying: no way; we need social workers here. Could the Minister please explain what work has been done by his department to engage ECE and engage Aurora College to try to build up the social worker program so we can develop social workers here, in the territory? Thank you, Mr. Speaker. HON. GLEN ABERNETHY: We are running about a 25 per cent vacancy in this area, so we lose about a quarter of our employees every year, which is deeply troubling, obviously. I am a firm believer that we want to recruit and train Northerners to do the important work that is needed in the Northwest Territories. I am a very big supporter of Northerners developing the skills to be social workers, which, if you don’t have a previous history or previous background, would require a degree in social work. The social work program that exists now, unless you choose to go south for the second portion, doesn’t give you the degree. I have shared my needs with the Minister of Education, Culture and Employment, both of them. They know the demands we have. The demands for social workers is clearly articulated in Skills4Success. I don’t think you will find anybody in this building who doesn’t want to support or feel the need for a degree-based social work program here in the Northwest Territories.